The Homesick Garden is a very unusual masterpiece. Antonia’s voice carries us through the novel and her unpretentiously clear way of looking at things evokes a complex mixture of admiration, despair and delight! The novel is a chronicle of life, charting Aunt Grace’s unexpected pregnancy and the way various members of Antonia’s family cope with this bombshell. At times Antonia’s view on life can be agonised but overall her no-nonsense approach is uplifting, “I liked the house silent and calm and bare without the angry little noises made by two people disliking each other.” This is Antonia’s critical view on her parent’s relationship! The significance of the title in this novel is not by any means extremely relevant. The Homesick Garden is mentioned in the third chapter, “The second rule is ….. the second rule is my homesick garden.” More importantly however is the “homesick-garden-time” when Antonia’s “Mum went off for a week. She’d been doing a lot of crying around that time. ‘I can’t cope!’ she would shriek.” This time obviously affected Antonia greatly and the homesick garden was never used again ‘after that summer’. We meet various zany characters during the course of the novel. Antonia is the watchful young narrator. The novel is literally smattered with theories on life. These theories are brought to the reader through Antonia. I felt that when I reached the end of the novel the trivial pieces of information faded into oblivion while Antonia’s ‘theories’ will certainly stay etched in my memory. This, I feel, is the legacy Antonia leaves us with. Antonia grows during the course of the novel. An example of this is her contrasting views on relationships at both the start and end of the novel, “At my worst, well at my worst I know that I can’t go out with boys”. While, in the concluding paragraph of the novel, Antonia woefully declares that, “As for Stephen, I think I’ll be an old, old woman before he does more than hold my hand in public and he’ll be an older man before I reach out and touch him”!!! I enjoyed Antonia as a character throughout the novel and even though she didn’t add as she said herself “oomph” to the novel, I believe, she added a whole lot more. Grace, on the other hand, aired everything out in the open and when she caused as much uproar in everyone’s life as she possibly could, she just vanished and hibernated for nine months. Grace is a very frank and earthy person and “she just loses her shape in her draperies” and, of course, “She was passionate about privacy”. She literally let everything go to hell and buried her head in the sand while Elizabeth had to be there to pick up the pieces. The major themes running through this novel include the issue of maturation, the problem of abuse is also highlighted, while cleanliness is, yet another theme. The theme of relationships is intricately woven throughout the novel. At the end of the novel we discover the reason for Elizabeth’s lack of self-confidence in relation to Grandma and the poor relationship she has with Antonia’s father. She had been physically abused by Quentin- a pompous young teenager whose family, the Thompson’s “hob-nobbed” with Grandma. Through Elizabeth, we receive a heart-rending and unsettling account of something that happened over thirty years ago but was still affecting her everyday life, “I was so frightened of it that I kept on forgetting about it. Until the next time.” “Did you get over it? ”, Antonia asked. ” Maybe I’d have got over it, if I hadn’t trivialised it, made some sort of wrong sense of it, if I’d tried to remember it more often. But I sliced it off, put it in a separate compartment in my mind.” This voice of experience is coming from the Elizabeth who used to “shake and tremble whenever anyone is cross with her”. Ironically, this is a ‘coming to terms with’ novel for Elizabeth, while it is a ‘coming of age’ novel for Antonia. Cleanliness, is a strange but relevant theme throughout the novel. Antonia’s father plays an important role in this area. Unfortunately, this poor individual is not given a name! ”Dad is always pompous when he’s nervous”. He is a very prim and proper man who, “doesn’t even answer the door in an emergency unless he’s shaved and has his socks on, armed to meet the world”! Well, we all have our problems in life!!! Cleaning can have very peculiar effects on people’s personalities. For Antonia’s father, he just could not stand the Mini Maids working for him, even though he is, “never very clear about why he can’t put up with them”. For Antonia, ”the kitchen transformed me from Florence Nightingale into Pioneering Woman”! I liked this novel. Even though it appeared to be ‘a light read’ it dealt with some important issues. 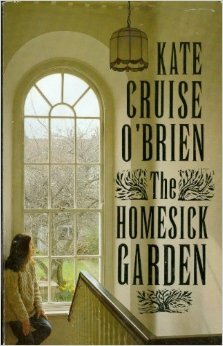 Although The Homesick Garden is Kate’s first novel she already has a renowned track record as the author of many collections of short stories. Kate, I believe, has a natural story telling ability and a knack of engaging the reader with the issues she chooses to explore, “I wish I could say that everything changed, changed utterly, after Mum’s revelation’s and that a terrible beauty was born”. Nothing mind shattering occurred during the course of this novel, yet it was a pleasure to get to know Antonia and her family. I came across a definition for reading today- ‘the intimate act of opening a book and getting lost within the covers’. I feel I accomplished that while reading this enchanting novel. Kate Cruise O’Brien was born in Dublin in 1948. She was the youngest daughter of the politician, historian and diplomat Conor Cruise O’Brien and his first wife, Derry born Christine Foster. Kate studied English in Trinity. 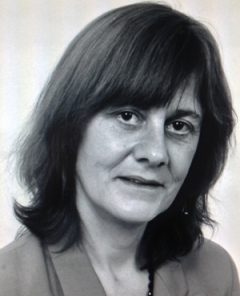 Her first short story, Henry Died, was published in New Irish Writing and won the Hennessy Award in 1971 when she was only 22. The same year she married Joseph Kearney and they had one son, Alexander. Her first book, A Gift Horse and Other Stories was published in 1979. It won the Rooney Prize for Irish Literature. She worked as a columnist with The Irish Independent during the ’80’s and her second book, The Homesick Garden was published in 1991. Kate Cruise O’Brien died suddenly in March 1998 and she is buried in Glasnevin Cemetery. Next Article Happy Memories of St. Ita’s Secondary School!